"I love using Yamaha digital pianos when I play live. The weighted keys feel just like a real piano, and they are dynamic and expressive. The piano sounds are also really true to life, ranging from a grand piano, to a warmer upright piano tone." 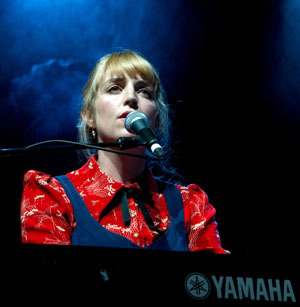 Sally Seltmann is the award-winning Australian singer/songwriter/producer behind intoxicating albums such as ‘Heart That’s Pounding’, ‘Somewhere, anywhere.’ and ‘The Last Beautiful Day’. She is the co-writer of the song ‘1234’, performed by Feist, and a member of Seeker Lover Keeper. Sally Seltmann previously performed under the name New Buffalo. Having started 2012 supporting Grammy Award winning artist Bon Iver throughout his Australian tour, Sally is now writing and recording the follow up to her 2010 solo album 'Heart That's Pounding'. Co-produced with Francois Tetaz (Gotye, Architecture in Helsinki), 'Heart That's Pounding' has been recognised by many as Sally’s most accomplished work to date. The album was released in Australia, North America and Japan, and was short listed for the Australian Music Prize. Indie Rock Reviews described the album as “a perfect blend of intelligent lyrics, Seltmann’s gorgeous voice and some amazing instrumentation”. Previous recordings by Sally as New Buffalo include her debut EP 'About Last Night'; which was released in Australia (through Modular) and the UK (through Heavenly). Her debut album ‘The Last Beautiful Day’ followed. Written, arranged and produced by Sally, the album featured performances from Beth Orton and Dirty Three’s Jim White. Her final album as New Buffalo came in 2007. ‘Somewhere, anywhere.’ was written and recorded by Sally on a century-old piano in a studio set up inside a flower-flanked shed in Sally’s backyard. In 2010 Sally collaborated with Holly Throsby and Sally Blasko to create ‘Seeker Lover Keeper’. The trio released their self-titled album mid-2011. The album debuted at #3 on the ARIA charts and is now available in the UK, Europe, Japan and North America. Sally enjoys collaborating with other artists, and recently set up her 'Alphabet Botanical' side project, a venture where she plans to write and record songs with many different musicians.